Seafood is best when served with butter. A hot, yummy, buttery bowl of keto shrimp scampi goodness will make even the worst of days better! Keto spicy sausage cream cheese dips is a wonderful appetizer or party dish any time of year. It has just the right amount of delicious spice and creamy! This keto bacon jalapeno cheddar cornbread is a delicious addition to any number of dishes. It is deliciously keto and with a kick! Skyline chili is a delicious staple of chili restaurants in Cincinnati. This keto skyline chili keeps the tradition alive without extra carbs or sugar! Candy canes mean winter like heat means summer. This keto candy cane ice cream is delicious and the perfect mix of mint and wintertime! A cold, yummy winter drink that’s creamy and boozy. 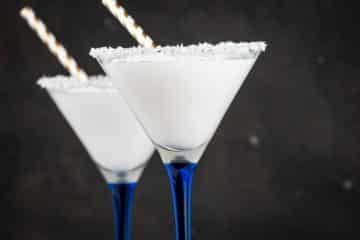 This keto snowbank winter cocktail is the perfect drink for a chilly winters night! Hollandaise is a delicious addition to tons of foods. This keto sriracha hollandaise sauce is tangy with a delicious hint of spice! Vinaigrettes are a wonderful dressing to add to salads and other dishes. This keto berry vinaigrette is light, slightly sweet, and absolutely delicious! Keto jalapeno popper baked chicken spaghetti is a delicious meal for anyone! The combination of cheese, chicken, bacon, and jalapeno make it irresistible!